Is this a Morgan Family Prius spotted in Chicago? It’s likely. Toyota has been marketing its Prius lineup as something closer to a family unit, and for good reason: the Prius, Prius C, Prius V, and Prius Plug-In are commonly considered viable and reliable family vehicles. 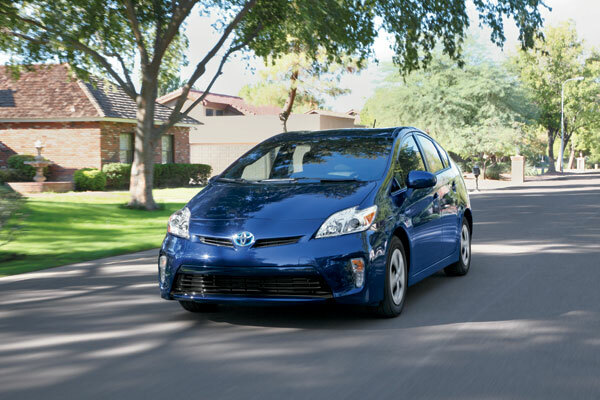 The Prius V was recently named one of Kelley Blue Book’s “10 Best Family Cars” for 2013 because of its fuel efficiency and copious cargo and passenger space. Those looking for confirmation of the Prius’ superlative function as a family vehicle need only look to the Morgan family of Chicago, which was recently profiled in the Chicago Tribune for its love of the Prius. Patriarch Jim “JP” Morgan (of no relation to the famous financier and banker) enjoys driving his 2013 Toyota Prius III in EV mode to fully appreciate the Prius’ quiet ride and is happy to do his part in reducing his carbon footprint. The Prius love is shared by Maggie Morgan, self-proclaimed housewife and part-time grandbaby-sitter, who drives a 2013 Prius of her own. She loves the fun she has and the money she saves by driving a Prius. But the Morgan family Prius love doesn’t stop there. The parents Morgan enjoy their eco-efficient rides so much that they’ve help ensure that their daughters Shannon and Kristin follow in their footsteps of reducing their footprints. Shannon, a Sales Operations Associate at a medical software/hardware company, drives a 2012 Prius III; Kristin drives her children around in the spacious and family-friendly Prius V. Each loves the reliability, fuel efficiency, and money-saving capabilities of their respective Prius vehicles (though Kristin seems to be somewhat jealous of Shannon’s solar roof package). With the Prius having sold more than three million models worldwide and a new generation of Morgan children learning from their environmentally responsible parents and grandparents, it’s entirely possible that the Morgan family will be responsible for up to a quarter of Toyota’s next three million hybrid sales.